Ellie-Louise Style had wanted to be a journalist for as long as she could remember, so once she had her A-Level results under her belt, there was no doubt that she would undertake a Journalism degree – the only decision she had left to make was deciding where to study. “I knew I wanted to study in London, which narrowed things down to start with,” says Ellie-Louise. LSBU had the best facilities, including a brand new newsroom, and that made it an easy decision for me. 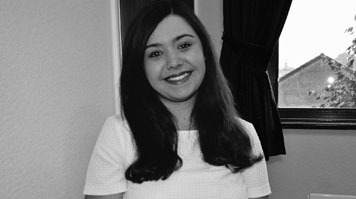 Having secured a place on the course, Ellie-Louise set out to make the most of the placement options that LSBUs reputation helps it offer. Ellie-Louise also hosted her own radio news show on Friday mornings from the Journalism department's radio studio, (part of the facilities at the newly opened Elephant Studios. “I learned a lot from that experience, including how to make content sound fresh and different even when you are having to deliver the same news more than once during a programme,” she says. As part of her degree, Course Director LJ Filotrani gave Ellie-Louise and her classmates the chance to create a live news programme, with students in Canada, Russia and the USA (among others), broadcast from the newsroom at Elephant Studios. “We produced the programme for Global Campus Network, and meant we had to deal with different time zones - we went live at around 3pm (London time) so it was great for us, but the other anchors in the USA ad in Russia had early and late starts! On another show we linked up with students in Australia!'' she says. When the results came in, Ellie-Louise got the chance to interview the winning candidate on television for Sky, and for ITV Anglia. “I thoroughly enjoyed the whole night- the adrenaline was really pumping.” she says of the experience. Ellie-Louise is keen to continue her journalistic training and is going on to study for a postgraduate MA – a challenge she is looking forward to greatly. LSBU really helped me to move on to the career path I've always wanted to follow, by giving me access to excellent facilities and training me on all the equipment I need to master. Find out more about BA (Hons) Journalism at LSBU and watch the course video.